Horror magazine Fangoria is partnering with Screenvision to bring 1984‘s controversial movie, SILENT NIGHT, DEADLY NIGHT back to the big screen beginning today, Dec. 4th, and running through the 17th. The film will be fully uncut and re-mastered using a high definition transfer. 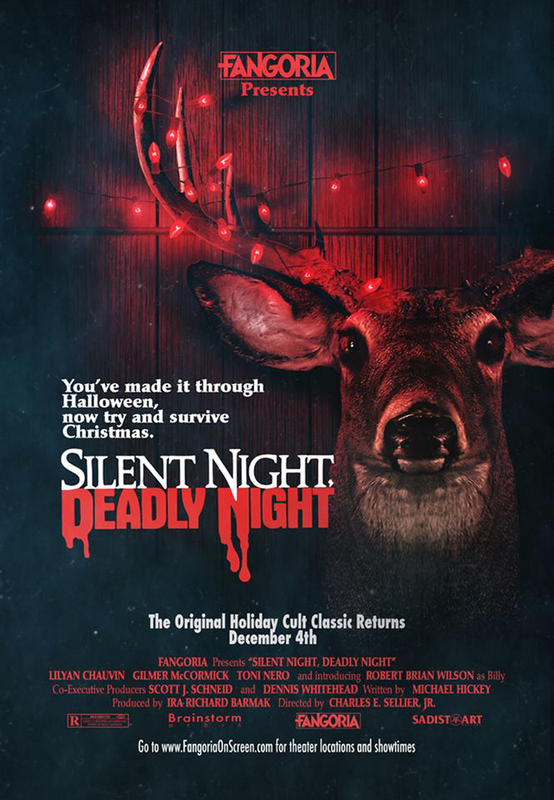 When SILENT NIGHT, DEADLY NIGHT was originally released, angered parents picketed theaters where it was being screened, and asked oncoming patrons to sign petitions to have the film removed from theaters. Two weeks later, the film had been withdrawn. Now, it’s getting its most widespread release in nearly three decades. We recently caught up with writer Michael Hickey, editor/second unit director Michael Spence, and producer Scott Schneid for an exclusive interview with Limelight Magazine. ADAM P. CRAY: Scott-SILENT NIGHT, DEADLY NIGHT is getting re-released in theatres in a stunning new HD transfer. Did you ever expect the film to get such a widespread re-release? SCOTT J. SCHNEID: Ummmm…no. (laughs). I had had hopes a few years ago that perhaps. Michael Spence and I were talking about this on the phone a few days ago. We saw the picture at a revival theatre in Los Angeles back in 2006 or 2007. 400 people lined up around the block! It was kind of like being at a ROCKY HORROR PICTURE SHOW screening and we just had a blast! It was like a revival meeting. Hooting and hollering and laughing just having a great time. At that point I was thinking “Wow, maybe there’s a market for SNDN as kind of almost like a ROCKY HORROR PICTURE SHOW item you could show at post-Thanksgiving up until New Years. Maybe on weekends in college towns for young people at revival theatres.” So that’s kind of where I was thinking. SCOTT J. SCHNEID: I did not expect distribution entities like Fangoria were going to come forward and actually get it out there on this many screens. No, I did not, and I am thrilled. ADAM P. CRAY: Yeah, me too! Michael Hickey, question for you: how did the story first come about (the original screenplay)? And did the script evolve much from early drafts to the final shooting script? MICHAEL HICKEY: The story had its original genesis in a script that was given to Scott by somebody whose name shall go unmentioned. Scott found the script useless except for the central idea of a slasher movie about Santa Claus. He never used any part of that script. I’ve never read it. Nobody’s ever described it to me, but he ran with the concept. Scott and his producing partner Dennis Whitehead brought me on board based on a spec script that I had written. We worked out the basic beats of the brand new story together then I went off and wrote a 30-page treatment fleshing out the plot and the structure and characters and some of the dialogue. On the basis of that treatment they got some money together to buy a screenplay and fortunately they bought it from me. I went off for I guess a couple of months and wrote the screenplay based on my treatment which was based on the story we’d worked out together. Of course with each step in that process the story became more elaborate and more completely fleshed and detailed. Once I handed in my screenplay, I would say that the movie changed virtually not at all on its way to the screen. So, the movie that you see this week is identical to about 99 percent of the screenplay that I turned in. All of the dialogue except a couple lines is word for word. Mr. (Charles) Sellier, the director, was very faithful to the written script when he made the film. ADAM P. CRAY: And that leads into my next question for Michael Spence: so everything in the script was filmed and included in the final cut? Is there any of SILENT NIGHT, DEADLY NIGHT that we did not see? Any scenes or shots end up on the cutting room floor? MICHAEL SPENCE: Nothing that I remember, nothing significant. This was a very low budget picture with a fairly short shooting schedule. You don’t really have the opportunity a lot of times to overshoot stuff. As far as my memory is that virtually everything that was in the script ended up in the movie. SCOTT J. SCHNEID: I just want to chime in for one second. Michael Hickey you might remember this as well. There were two short scenes in Michael Hickey’s original screenplay which did not make it into the movie. Michael-remember when the family first arrived at the mental hospital? There was a scene where they were walking down the corridor and some crazy old lady grabs Billy and says “He’s the dopey one, Doctor. Lock him in the room!” or something like that. Is that a scene we originally had in our script? MICHAEL HICKEY: I don’t remember…There’s a extended edition out on video which has some footage in it that was not in the theatrical release. But having looked that version over on Youtube you can tell the new footage because it’s “work print” or something. Quality goes bad when the added footage comes up. It seems to me (and it’s been a few years since I wrote that) there were no complete scenes. There were trims and ends. It was just some stuff that was tightened for pace. ADAM P. CRAY: And Scott: as producer, what was the biggest challenge during pre-production and then into production? SCOTT J. SCHNEID: I wish I could answer that question because Dennis Whitehead and I had co-executive producer credits on the movie. We developed the script with Michael from inception. However, we brought the script to a gentleman who had a deal at Tri Star Pictures in 1984 named Ira Barmak who had a deal at Tri Star to make some low budget films. What ended up happening unfortunately for Dennis and I was that once we made a deal with Barmak, he got the picture funded by Tri Star. We were just young guys 26 or 27 years old and this was our first Hollywood experience and we were kind of frozen out of the production. So, Dennis Whitehead and I developed “the baby”. Michael was the writer. Dennis and I also raised approximately $40,000 at that time for seed money to hire Michael, to pay Michael. Part of that was Michael and we did a lot of the hard work and unfortunately did not get to see our “baby birth”. We were basically locked out of the situation which was sad for us. So, Dennis and I had developed it, raised a huge amount of money, came up with the concept. Michael did all the writing then we did not get to see it come to life. A lot of first time Hollywood people have that kind of experience. It does happen. ADAM P. CRAY: Oh yeah. I’ve heard stories. (laughs) Scott-what was your reaction to the public’s reaction during the film’s initial release? Did you ever expect parents picketing theatres? SCOTT J. SCHNEID: No, I did not. I don’t think Michael Hickey or I or Dennis were [when] developing the script. We were just psyched that we were in the middle of this maelstrom of genre movies getting made. Our horror movie/slasher movie seemed a little bit better than your then-typical formulaic slasher movie with a back story told in two minutes somewhere about halfway through the movie. You know the killer is anonymous and the back story is told in two minutes. We decided as we developed the treatment and the script that the back story was actually a really fascinating part of the story. We wanted to get to know this character and see what happened to him from when he was a child. How he was traumatized. So we were just excited about developing this cool script. We knew we were developing an R-rated movie for the teen audience at the time. I can’t speak for Michael but I never thought for one second that there was going to be that kind of backlash. MICHAEL HICKEY: We’re often asked if we ever expected any of that and since it happened in such a big way there’s a feeling that it must have been inevitable, that you must have seen it coming. But, in reality, to my knowledge, nothing like that ever happened before. It was completely unpredictable. Completely unexpected by Scott and me and Dennis. I’m sure that Tri Star didn’t expect this because their hair caught fire when it happened. It was a total surprise. And who could’ve imagined that the CBS Evening News would cover the opening of a movie like this. What they were covering of course was the controversy. But it just took hold and the fire spread and it got completely out of control…which I thought was hilarious and wonderful. I think Scott did too. Up until Tri Star pulled it. But the movie’s still alive. It was the #3 top grossing movie the weekend that it opened. SCOTT J. SCHNEID: The picture was made for $1,065,000 I believe it was a negative pickup and in ten days it grossed almost $4,000,000 or a little more at the box office and that was only really on about one-third of the screens in the country. Tri Star was going to release the picture wide to the rest of the country two weeks later but because of the controversy…It was my understanding that Coca Cola (which was a part owner of Tri Star at that time along with CBS and HBO) said “we want this picture out of theaters”. ADAM P. CRAY: For sure! Question for Michael Hickey: as you were writing the script, had you thought, or any of you, thought of a future franchise? With sequels being so prevalent today, you can plan for two or three films if the first is successful. Were you guys thinking ahead like this as you were producing the original? MICHAEL HICKEY: Whoever it was that made the sequel clearly had no interest in a new script, a new thought, a new idea. 80 percent of the package is footage that they recycled from the original. SCOTT J. SCHNEID: 3, 4 and 5 which were all made by LIVE Home Video had nothing to do with our movie. They just used the title: SILENT NIGHT, DEADLY NIGHT Part 3, Part 4, Part 5. I don’t even think there was a Santa Claus character. They were just capitalizing on the title and the video boom of the mid-to-late 80’s and they were using the title just knocking out these crappy made for video sequels that have nothing to do with the original. For me it was a sad day in a way. Michael certainly would’ve loved to have a hand in steering the ship in the future for SILENT NIGHT’s “children” and he didn’t get a chance to do that. MICHAEL HICKEY: I definitely would’ve. I don’t think we have anything more to do with the concept once SNDN is over. What can you do that’s not just a repetition? MICHAEL HICKEY: Yeah, that’s true. ADAM P. CRAY: I think Part 3 actually had the Ricky character, but didn’t have any other resemblance to the first film. That was about it. MICHAEL HICKEY: I never saw any of them so I suppose I shouldn’t comment on their quality (which I think was atrocious). SCOTT J. SCHNEID: I’m probably one of the few people in the world that saw Part 2 theatrically. It was released at the Egyptian Theatre on Hollywood Blvd. in the back theatre. You know, the Egyptian has the main theatre, then two small theatre bunkers in the back and I was there with three people I think and I could not believe what I was watching. Half, if not more of the movie, was footage from our movie. And I heard that they did it for like $250,000 and just shot the new footage and wrapped the footage from our movie around the new footage. MICHAEL HICKEY: Let’s talk about ours some more. SCOTT J. SCHNEID: Yeah, I was amazed. ADAM P. CRAY: Why do you guys think the original film has become such a cult classic among horror fans? What do you think sets it apart? SCOTT J. SCHNEID: Now that all that craziness from the mid-1980s is long gone (all the mothers and the madness and publicity) people can watch it now and appreciate what Michael said before. There’s a real edge of black humor to the movie and satire. A black humor edge to the movie that really comes across when you remove it from all that craziness that was going on in the maelstrom of publicity and craziness that was going on when it came out. And now all these years later you look at it and wow there’s actually a story there that’s a cut above (excuse the bad pun) the typical boring formulaic slasher movie from that era. And on top of it, it’s got that fantastic edge of black humor that Michael brought to the project. I think that’s the big reason it’s lived on. ADAM P. CRAY: I remember watching it as a young kid and even thinking that the scenes are logical. Everything in the film is logical. How he becomes the killer. It’s organic and I appreciated that even back then. Not just being a cut ‘em up from the beginning. I really like the backstory and what you all did. SCOTT J. SCHNEID: Thank you. MICHAEL HICKEY: And so we backed out of that. I’m glad to hear you say that it struck you as logical because that was really a big part of the effort: to sort of line up the dominoes in a way that is sequential. It’s not just the first one but then it’s always fun to watch them fall. You know they’re gonna fall. You know how it’s gonna end up. I always assumed the audience for this movie knew where it was going from the beginning. So watching it get there, watching what happens to Billy and how his descent into Santa Claus-clad madness is pretty ordained. It’s inevitable. He can’t extricate himself from his fate. And so we’re watching fate play itself out on him and I actually think it’s funny. It all is a little bit over the top, tongue in cheek and the audience seems to respond to it which is what I was going for. SCOTT J. SCHNEID: It’s funny that you say that Michael because when we were trying to set the film up, with Dennis Whitehead, my partner, and get money prior to Tri Star coming into it, I had a meeting with a Canadian producer that had read the script. He said “It was kind of boring in the first half. I really like the second half when Santa goes on his rampage. Why do you have to have all that backstory in the beginning and all that?” I said, “That’s what’s different about it. That’s what’s interesting about it. So you almost sympathize with the character and you understand what that character went through. How the character became and why he became what he became.” I was just getting Formula Slasher 101 back from this money person. That’s not what Michael, Dennis, and I wanted. ADAM P. CRAY: I remember watching it for the first time paired with HALLOWEEN I & II. At the end of SNDN when Billy dies, I felt terrible. Because of that back story, you understand him. You understand where he was coming from. Maybe over the top, but still very effective. For a complete listings of screenings in New England, visit http://www.screenvision.com/cinema-events/sndn/#theaters_list. Adam P. Cray is a Los Angeles-based filmmaker and entertainment correspondent. His work includes killerfilm.com and morehorror.com and he has worked at various capacities for MGM and 20th Century Fox studios. His film work can be seen at facebook.com/cinemastarproductions and youtube.com/cinemastarprods.